I cut my teeth on this hardware sequencer 22 years ago. There was a long break from it in the noughties when I switched to sequencing on a Mac, using Cubase, then Ableton Live. But my development of a technique to synthesize FSK sync signals in Ableton Live and send this as audio to the MC-50's sync-in jacks, has enabled me to slave this hardware to my software with rock-solid timing, giving me the best of both. (For details see this article on my website). Why use this old technology today? I've found many reasons, but I suppose they can be generalised as either "speed" or "fun", often both. Keystroke commands can be so much quicker than using a mouse. They are generated at a lower level of brain architecture, and so have a less disruptive effect on conscious attention, allowing it to focus on the creative effect of the task. Using a mouse engages more parts of the brain, and at a higher level of architecture (e.g. optic cortex needs to track the pointer, and relay this information to the motor cortex controlling the mouse-hand). The result of using keystrokes is a feeling of freedom and flow when creating and editing midi parts. Of course, this assumes you have put the time in to acquire the skills in the first place. The time spent is always repaid well. • [PAUSE] + [RECORD] allows you to start recording (or erasing) from the very tick (one tick is a 96th of a quarter note) that you are stopped at. • UTILITY 8 (tune) sends an A4 note on all channels when you need to check audio connections or tune your analogue synths. • [STOP] + [MIDI] sends an All Notes Off message on all channels. • [PAUSE] + [MIDI] updates all pitchbend and CCs up to that point in the song. • Hit [LOC] and a number to jump to a Locate point, hit [LOC] + [REC] then a number to set a Locate point right where you are. For rapid rhythm pattern recording, the MC-50 uses the classic old Roland step-write-while-running style of an 808 or a 909, with eight levels of accent. Its quick and intuitive even just using the 2 line display and the key pad, but it's even better if you are using a midi controller keyboard with a sustain pedal, as this allows instant erase of any particular voice by holding the key down with the pedal depressed, while the pattern loops. I've never seen a faster way of writing/editing rhythms - shame they are only one bar long! But once you write them into the Rhythm Track, you can quickly copy them into a "Phrase" track (a Phrase track is everything else that is not a Rhythm track) to allow sophisticated editing/quantizing that simple pattern writing doesn't allow, so you start simple, then get busy. There are creative reasons as well. The MC-50, like some other Roland products such as the MC-202 and the TB-303, allow an interesting type of composing whereby you can at first enter, in step time, the notes or chords you want to use, without worrying about their timing position. Then, once they are entered, you can then write, in real time, the velocity/step/gate time of those previously-written notes or chords independently of the actual note values. (Roland call this MODIFY RECORDING). This can get interesting, say, if you send it the midi notes of a groove or a drum machine pattern that you want your sequence to conform to. Another instant-gratification creative feature are the mute buttons. There are mute buttons for the Rhythm, Tempo, and the eight Phrase tracks. These allow on-the-fly arranging while you are synced to your DAW... Ableton can only beat this for fun if using a fancy, expensive control surface. 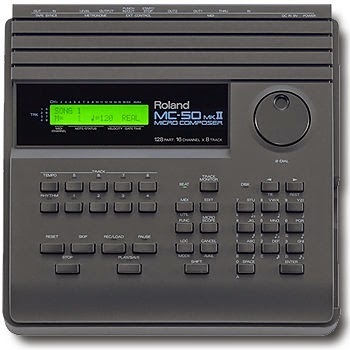 Speaking of syncing, there is a widely reported bug in this series of Roland hardware sequencer such as the MC500/MC500mkII/MC50 etc, whereby the unit, when externally synchronized in "loop" or "cycle" mode (the term Roland uses is "Block Repeat"), gets out of time with the sync signal it is being sent. Analyzing this, I have discovered it is because it gains a single tick when the loop rolls around again from the end point to the start, causing the timing lag to increase with every cycle. Therefore the bugfix is to specify the loop points, not by bar number, but by LOC (locate) points. This allows you to set the points down to single tick resolution. Place the first LOC point at the 00 point of the first bar, and the end LOC point one tick less than the end of the last bar i.e. at beat 4, tick 95, of the last bar. And so by holding [SHIFT] while hitting [PLAY], loop play will start when the external clock arrives, and continue to play the loop indefinitely, accurately locked to the DAW. I've written a one page shortcuts guide that I keep near my machine. You can download it here. Great article! I've read this on your website earlier on, and I am very interested to replace the diskdrive as well.. Thanks for the documentattion..
Hi there, any chance you will be adding your Casio CZ 101 renovation post to this blog? I bought a non-working CZ 101 recently and I was using your excellent blog entry as a tutorial for teardown and rebuild. Your pics and info were very helpful! I understand if you prefer not to, maybe it is archived somewhere? I looked but had no luck. Hi I’m trying to copy my recorded rhythm track into a phrase track ie track 1 so I can use the same midi data but use a bass sound instead on the new track so the drums and bass are playing same thing. I did the copy procedure and now track 1 lights up but when I turn off the rhythm track I hear no sound on track 1 . If I did get this to work I was going to then transmit track 1 to a different midi channel where that bass sound lives on the same module . Have not had any luck finding out how on anything on google as this thing is ancient now so any help would be appreciated . Thanks in advance . In the copy procedure, you have to make sure your destination bar is at the start of the song, because it defaults to the end. In other words, the rhythm track you just copied to track one may now start at the bar number where the original track finished! Have you checked the contents of Track 1 in microscope mode? Make sure the expected data is there and on the expected midi channel, starting at Bar 1. If that all looks OK, then go into Function 11 and make sure all midi tracks are transmitting to both physical midi outputs. Then check Function 12 (which should be fine unless you have deliberately changed something) which shows if midi channel numbers are being converted to a different number. No problem. In the first 10 years I owned this machine, I would once a year just go through the manual again, because I always found something I didn't know!! So, after copying, the data in track 1 is still on midi channel 10, you haven't converted it yet? (EDIT #8) and you mute the Rhythm track and still no drums play from track 1? Bizarre. No other modules connected? The JV is set up in multi mode? yeah i mean i hadn't done edit 8 yet but just did - assigned track 1 to midi channel 2 and the jv1010 is in 'performance' mode. im reading up on some of the jv stuff right now but either way, when i inspect the data on track 1 after the copy with the microscope i see all the data but when i turn off rhythm track i still hear nothing on track 1 even though data is there. it shouldn't need to be this complicated to do such a simple task. i love roland gear but their manuals are the worse. they tell you how to do certain processes but not why and no troubleshooting and no sample workflows. written for a midi expert by a midi expert. if not for you and others online i'd have gone back to my DAW long ago. Not sure what to do next. do i need to send a program change like bank/patch? i don't know how to do that but willing to try! Sorry I don't have a JV1010 to test. But have we established where the problem is? If you copy the data over to the new track, before changing the midi channel, does it play the drum notes? If it does, and then doesn't play when you change midi channels, then, yes, it sounds like you need to troubleshoot the midi set up on the JV, e.g. make sure there is full midi volume (CC#7) and that the right PG and bank messages are sent to get the sound you want. Oh, and always, when troubleshooting midi between two devices, you should temporarily bypass any patchbay. Just direct connections, less variables that way! well the good news is on further inspection I realized that for the data copy i did, it did indeed start it much later, so i redid it and made sure it was starting at beginning, (the data was a little hard to understand till i realized which part was measure #) and now my copied data is playing on track 1 from the beginning. Now I think it comes down to the performance settings on the JV and I'm digging into that manual to see how to set it there so I can play the diff sounds on the diff tracks. I feel like I have the mC50 settings right for that now. I reset all the performances on the JV in case the previous owner had certain settings that were still on there that might be causing a problem. Hopefully I can get that part figured out tonight! Almost there... one step closer! The patch bay actually solved a lot of the cabling issues and I just have it on pass through mode, "live keys" which is basically just the ins and outs. no special settings. This website, the images and information, are provided as is, without any representations or warranties, express or implied. I make no representations or warranties in relation to this website. Nothing on this website constitutes, or is meant to constitute, advice of any kind. I am not a qualified technician, audio engineer, or electronic engineer. If you require advice in relation to any technical matter you should consult an appropriately qualified engineer. I will not be liable to you (whether under the law of contract, the law of torts or otherwise) in relation to this website for any direct, indirect, special or consequential loss, or loss or corruption of information or data, or damage to any equipment or instrument, or personal injury to any persons. Nothing in this disclaimer will exclude or limit any warranty implied by law that it would be unlawful to exclude or limit; and nothing in this disclaimer will exclude or limit my liability in respect of any matter which it would be illegal or unlawful to exclude or limit, or to attempt or purport to exclude or limit, my liability. A Disco Ate My BABY! All content this page copyright © Adam Inglis 1984-2017 unless otherwise specified. Simple theme. Theme images by merrymoonmary. Powered by Blogger.